Hi! Today I’m going to write about “the synesthesia”. 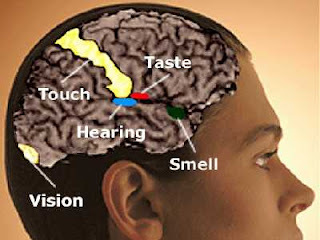 Do you know what is synesthesia? Ok, as I understand it The synesthesia is when people associate something or a situation with another. For instance: Beth might see the red color as a algebraic symbol, but not everybody have this kind of capacities; people who have these knowledges are able to help scientists in their researchers about cognitives process, also I think synesthetes are more creatives on the contrary people who don’t have this capacity, in the same way I believe to be a synesthete person is a great advantage since many famous people have been labeled as synesthetes on the basis of at least two historical sources. On the other hand and as my point of view I believe is important to indicate the term mirror-touch synesthesia, it is when synesthetes suffer the pain or happiness of another person: for example, when one person feels depressed then one synesthete will feel exactly same, I think this situation is very similar to sensations which experience the twins. Finally, I believe this article is very interesting, therefore I would suggest to my classmates what they read about this kind of information.